Giveaway Genie Timeline 10 full serial license key for free. Version on this offer is home edition. Also found free license key offer for professional edition. And you can download unlimited number of Genie Timeline 10 license key code for free on this offer. Save $39.95 because the giveaway version now absolutely free. 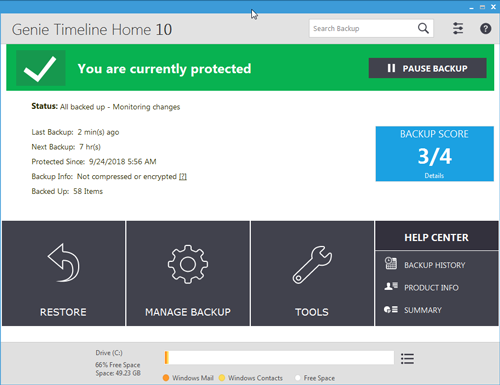 Genie Timeline offer easy solution to backup data offline or online. It alternative software for the best backup tool NovaBACKUP Pro. This Genie products offer easy data protection for business, personal, and professional users. The software features with a backup score to view backup activity. On this giveaway, full serial license key for Genie Timeline Pro/Home is 100% free. As mentioned above, the free license key Genie Timeline 10 is available for home and professional edition. Get the software for free on the following offer page. Giveawa Link Genie Timeline Home 10: Get the software! The giveaway is provides by Genie9 in collaboration WinX DVD. Whereas Genie Timeline Pro edition offered by PC Pro. It old offer but the code also work on version 10. To get the backup tool for free, visit the offer page above. Fill up the requires form then click register. You’ll receive the license key with the download link via email. You can combine the both version backup tools with ZOOLZ Cloud to make sure your data safe. The backup tool features with 256-bit AES military-grade encryption. It to protect data especially when backup to cloud storage. The software also features with simple backup & restore that can be used for a beginner. Genie Timeline Home 10 giveaway version without free support. To get full features you can upgrade to pro using Genie Timeline Pro coupon. Get extra benefit on professional edition. System Requirements. The software supports and works on Windows XP, Vista, Windows 7, Win 8 and Win 10. It works on 32-bit and 64-bit platform.